Red Falcon / White Lightning (RF/WL) is Robert Eckert and Jeff D. Elliott. Following up last year’s double CD release Rootsy!!! Rocky!!!! Power!!! Poppy!!! 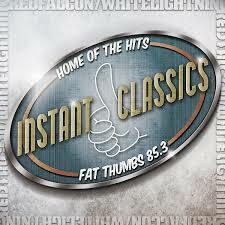 !, the band recently released an EP of new tunes: INSTANT CLASSICS. Our latest effort called INSTANT CLASSICS was begun in early January and completed for a soft release at Molly Blooms in Stratford on April 18, 2014. It’s speedy production was recorded with a full band consisting of members Hugh Wilson (guitar, BG vocals), Nelson Sobral (guitar, BG vocals) and Kevin Jagger (drums), as well as Pete Gorman (from Young Doctors In Love) playing keys on every song. Unlike R!!!R!!!!P!!!P!!! !, where Jeff and Rob produced the majority of the sounds, each player’s amazing playing and off-the-cuff creativity lead to so many happy accidents that shaped the attitude and vibe of the EP, solidifying the group as a cohesive band. Red Falcon / White Lightning is like a sparkling cherry-coloured ’67 Cutlass sitting in the garage. People don’t get to see it that often, but the car, with its white racing stripes, stays with them. They talk about the sightings, and listen for the rev of the engine. With a full tank of equal parts Elvis Costello, Josh Homme, AC Newman, Joel Plaskett & James Mercer, RFWL stealthily slips out onto the songwriting superhighway, foot on the gas without plans for pit stops. They’ll be your favourite band you just might never get to see. With INSTANT CLASSICS, Red Falcon / White Lightning brings tight musicianship, strong vocals and an eclectic range of music – all delivered with a sense of passion and big fun. Catch them live if you can – and check out this record! In the meantime, you can get a sneak peek at INSTANT CLASSICS on the band’s YouTube video on the making of the record. You can also find Red Falcon / White Lightning on: CBC, Bandcamp and YouTube.